The Hawaiian crow faces an ample number of threats in the wild. The Hawaiian crow faces an ample number of threats in the wild, which are considered contributing factors to their extinction in the wild. Small population size makes the species more vulnerable to environmental fluctuations, leading to a higher likelihood of inbreeding, which could result in lethal deformities. Unlike most crows, Hawaiian crows did not adapt well to human presence. Persecution by humans is another threat to their survival. Farmers have shot ʻalalā because they were believed to disturb crops. Illegal hunting has continued even after legal protection was granted to the crows. Humans have also caused habitat degradation and deforestation through agriculture, ranching, logging, and non-native ungulates. Loss of canopy cover exposes the ʻalalā to dangerous predators. Chicks are vulnerable to tree-climbing rats and, after they leave their nests, to cats, dogs, and mongooses. Deforestation also increases soil erosion and the spread of invasive plants and mosquitoes. This directly relates to the primary cause of the Hawaiian crow's extinction, disease. Avian malaria is a parasitic disease of birds, caused by Plasmodium relictum, a protist affecting birds in all parts of the world. Usually this disease does not kill birds, however in an isolated habitat such as Hawaii, birds have lost evolutionary resistance and are unable to defend against the novel protist. Its main vector is the mosquito Culex quinquefasciatus, introduced to the Hawaiian islands in 1826. This introduction can be attributed to birds club that brought nonnative species to replace birds that fell victim to the Avipoxvirus. At least 100 introductions have been documented in this manner. 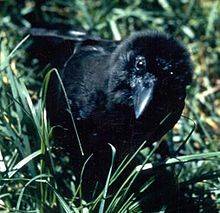 The Hawaiian crow has been extinct in the wild since 2002. In December 2016, five juvenile male Hawaiian crows were released into the Pu'u Maka'ala Natural Area Reserve on the Big Island, marking the first time the birds had been present in the wild since 2002. However, within a week of reintroduction, three of the five birds were found dead. Two of the deaths were caused by the Hawaiian hawk, and the other death was due to starvation. The remaining two crows were taken out of the wild. ^ a b Sakai, Howard F.; Ralph, C. John; Jenkins, C. D. (1986-05-01). "Foraging Ecology of the Hawaiian Crow, an Endangered Generalist". The Condor. 88 (2): 211–219. doi: 10.2307/1368918. JSTOR 1368918. ^ a b "Hawaiian crow photo – Corvus hawaiiensis – G117026". www.arkive.org. Wildscreen Arkive. Archived from the original on 2015-11-20. Retrieved 30 October 2015. ^ Banko, Paul C.; Ball, Donna L.; Banko, Winston E. (2002). "Hawaiian Crow (Corvus hawaiiensis)". In Poole, A. The Birds of North America Online. Cornell Lab of Ornithology. Retrieved 2009-03-20. ^ Mitchell, Christen; Ogura, Christine; Meadows, Dwayne; Kane, Austin; Strommer, Laurie; Fretz, Scott; Leonard, David; McClung, Andrew (October 1, 2005). "7: Species of Greatest Conservation Need". Hawaii's Comprehensive Wildlife Conservation Strategy (PDF) (Report). Honolulu, Hawaiʻi: Department of Land and Natural Resources. p. c.189. Retrieved 2009-03-20. , 16 MB file. Pages are largely unnumbered but entry for "ʻAlalā or Hawaiian Crow" is roughly on page 189. ^ "'Alalā – Pacific Islands Fish and Wildlife Office". www.fws.gov. Retrieved 2015-10-30. ^ "Draft Revised Recovery Plan for the ʻAlalā (Corvus hawaiiensis)" ( PDF). United States Fish and Wildlife Service. October 2003. ^ a b c d e "Hawaiian Bird Conservation Action Plan – Hawaiian Crow". Pacific Rim Conservation (pdf). 2013. Retrieved 2015-10-29. ^ "Alala – The Hawaiian Crow | BirdNote". birdnote.org. Retrieved 2015-10-30. ^ Rutz, C.; et al. (2016). "Discovery of species-wide tool use in the Hawaiian crow". Nature. 537 (7620): 403–407. Bibcode: 2016Natur.537..403R. doi: 10.1038/nature19103. PMID 27629645. ^ "Tropical crow species is highly skilled tool user" (Press release). Phys.org. 2016-09-14. Retrieved 2016-09-15. ^ "U.S. Fish & Wildlife Service Endangered Species". www.fws.gov. Retrieved 2015-10-30. ^ "NatureServe Explorer: Species Name Criteria – All Species – Scientific or Informal Taxonomy, Species – Informal Names." NatureServe Explorer: Species Name Criteria – All Species – Scientific or Informal Taxonomy, Species – Informal Names. NatureServe. Web. 29 Oct. 2015. ^ "Comprehensive Report Species -". explorer.natureserve.org. Retrieved 2015-10-30. ^ Culliney, Susan; Pejchar, Liba; Switzer, Richard; Ruiz-Gutierrez, Viviana (2012-09-01). "Seed dispersal by a captive corvid: the role of the 'Alalā (Corvus hawaiiensis) in shaping Hawai'i's plant communities". Ecological Applications. 22 (6): 1718–1732. doi: 10.1890/11-1613.1. JSTOR 41722888. ^ Holden, Constance (1992-05-22). "Random Samples". Science. New Series. 256 (5060): 1136–1137. Bibcode: 1992Sci...256.1136H. doi: 10.1126/science.256.5060.1136. JSTOR 2877246. ^ "'Alalā – Pacific Islands Fish and Wildlife Office". www.fws.gov. Retrieved 2015-10-29. ^ Walters, Mark Jerome (October–December 2006). "Do No Harm". Conservation Magazine. Society for Conservation Biology. 7 (4): 28–34. Archived from the original on 2007-09-27. Retrieved 2007-01-08. ^ KFMB-TV (August 9, 2014). "Hawaiian crow breeding season a success". Retrieved 2014-08-13. ^ "Hawaiian Crow (Corvus hawaiiensis) – BirdLife species factsheet". www.birdlife.org. Retrieved 2015-10-30. ^ Kuehler, C.; Harrity, P.; Lieberman, A.; Kuhn, M. (1995-10-01). "Reintroduction of hand-reared alala Corvus hawaiiensis in Hawaii". Oryx. 29 (4): 261–266. doi: 10.1017/S0030605300021256. ^ a b Ashe, Ivy (March 18, 2017). "Experts work to improve alala's chances after release deaths". West Hawaii Today. Retrieved March 20, 2017. ^ ‘Alalā Released Into Natural Area Reserve. Aliso Laguna News (2017-09-27). Retrieved on 2017-10-01. ^ Ako, Diane. "Rare Hawaiian crows released into native forests of Hawai'i Island". Retrieved 2017-11-06. ^ "'Alalā released on Hawaii Island in 2017 appear to thrive". Hawaii 24/7. 2018-04-17. Retrieved 2018-05-02. ^ "Malama Kī Forest Reserve Impacted by Eruption". Big Island Now | Malama Kī Forest Reserve Impacted by Eruption. Retrieved 2018-06-29. ^ "5 more alala released into wild - West Hawaii Today". www.westhawaiitoday.com. Retrieved 2018-09-29. ^ "Released Hawaiian Crow Found Dead In Forest". www.bigislandvideonews.com. Retrieved 2019-01-22. ^ Harvey, Nancy C.; Farabaugh, Susan M.; Druker, Bill B. (2002-01-01). "Effects of early rearing experience on adult behavior and nesting in captive Hawaiian crows (Corvus hawaiiensis)". Zoo Biology. 21 (1): 59–75. doi: 10.1002/zoo.10024. ^ "$14M Effort Announced to Save Rare Hawaiian Bird". Science, Global edition. The New York Times. AP. April 17, 2009. Retrieved 2013-08-10. ^ Walters, Mark Jerome. Seeking the Sacred Raven: Politics and Extinction On a Hawaiian Island. Washington: Island Press/Shearwater Books, 2006. 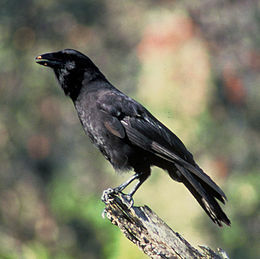 Wikimedia Commons has media related to Hawaiian crow.